Public Mode Enabled :: Basic earthquake movies and helpful scientific pages for the media and the general public. Scientific Mode Enabled :: Earthquake movies, 1D and 3D synthetic seismograms for seismologists. 3D synthetic seismograms accurate to periods >=17s for model S362ANI (Kustowski2008) and crustal model CRUST2.0 (Bassin2000) calculated based upon the spectral-element method. Duration: 100mins (MW<7.5), 200mins (MW>=7.5). Computed using Specfem3D_Globe 7.0.0. 1D synthetic seismograms accurate to periods of 8s and longer for model PREM (Dziewoński/Anderson1981) calculated based upon normal-mode summation. Duration: 100mins (MW<7.5), 200mins (MW>=7.5). This figure illustrates the format of the CMTSOLUTION file used to generate synthetic seismograms. 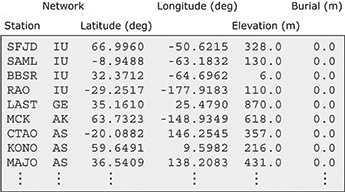 Earthquake locations are given in geographic coordinates. half duration: source half duration. It is set to zero during computation of synthetic seismograms, which corresponds to simulating synthetics with a step (Heaviside) source-time function, i.e., the moment-rate function is a delta function in time. This figure illustrates the format of the STATIONS file used to generate synthetic seismograms. Station locations are given in geographic coordinates. -m CMTSOLUTION: set event information. -s 1.0: resample the data to a sampling rate of 1 sps. -l 0/4000: cut data between 0 and 4000 seconds. -i -f: deconvolve the instrument response from the observed data using the pole-zero files provided in the same directory of the data and apply a band-pass filter. -t 40/400: corner periods of the filter are 40 and 400 seconds. -p: pick P and S arrivals according to iasp91 model. -x proc: add *.proc extension to the filenames of the processed data. NOTE: Please make sure that the SAC, saclst, and IASP91 packages are installed properly on your system, and that the environment variables (e.g., PATH) are set properly before running the script. -S: synthetics are in SAC binary format. -m CMTSOLUTION: set event origin, location and half duration. -h: convolve synthetics with a triangle source-time function with the half duration provided in the CMTSOLUTION file. -s 1.0: resample the synthetics to a sampling rate of 1 sps. -l 0/4000: cut synthetics between 0 and 4000 seconds. -f: use the same band-pass filter used in the deconvolution of the observed data. rotate.pl rotates the horizontal components (e.g. LHN/LHE) of both observed and synthetic seismograms to the radial and the transverse directions (e.g. LHR/LHT). -l 0: start time of the seismograms at 0 seconds. -L 4000: end time of the seismograms at 4000 seconds. 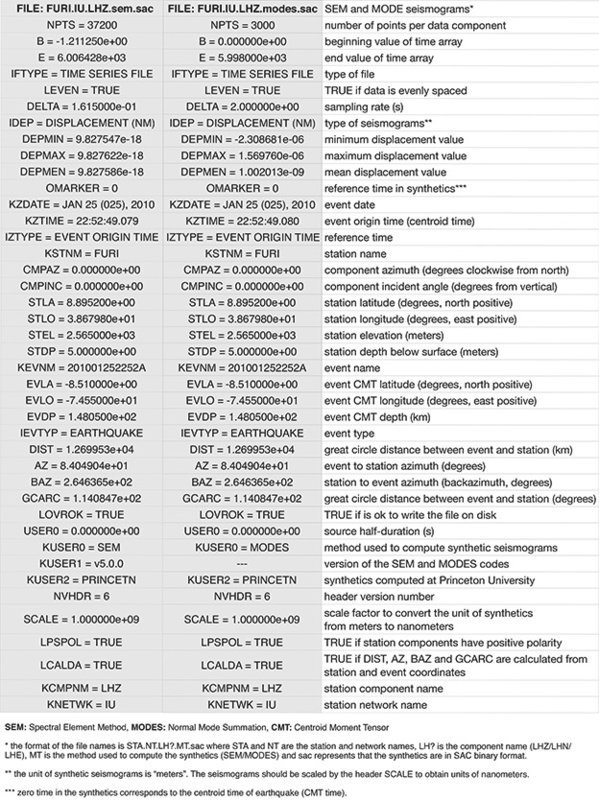 -d: directory where the processed horizontal seismograms are located and the radial/transverse components will be written. NOTE: Please make sure that the SAC and saclst packages are installed properly on your system, and that the PATH environment variable is set properly before running the script. Global ShakeMovie is Princeton University's Near Real Time Global Seismicity Portal (Tromp et al. 2010). It has been designed to present seismologists with near real time 1D and 3D synthetic seismograms for recent earthquakes. These synthetics are the results of simulations carried out on a large computer cluster. 1D synthetic seismograms are calculated based upon normal mode summation. Movies and 3D synthetic seismograms are calculated based upon the software package SPECFEM3D_GLOBE. Synthetics (3D and 1D) will be available for download 7.5-11 hours (M<7.5) or 16.5-18.5 hours (M>=7.5) after receipt of notification from the Global CMT Project.